Last week, Google presented the findings of its 2014 Traveler Study in a one hour webinar. The data covered a wide range of topics, including mobile behaviors, inspiration, travel research, mobile behaviors, the influence of TV and Video, and family travel. The webinar was hosted by Katy Galambos, Google’s Industry Analyst for Travel. Here are some of the highlights with regard to the behavior of consumers booking travel on smartphones. Travelers use smartphones throughout the travel process. Google researchers found, while delving into the mobile behaviors of travelers, that 67% of leisure travelers and 78% of business travelers use smartphones at some point during the travel process. 77% of travelers use their smartphones for inspiration in spare moments such as when waiting and commuting. Travelers are also researching and booking across all devices. When asked “Where have you booked a hotel?” business travelers mostly book via apps (60%), whereas leisure travelers still prefer mobile websites by a small margin (37%). Both booking avenues are still important. Hotel bookers still use brands’ mobile sites, even after they download travel apps. A poor mobile experience is sending your customers to your competitors. A poor mobile experience doesn’t just force travelers to move elsewhere. It also has a negative impact on your brand. 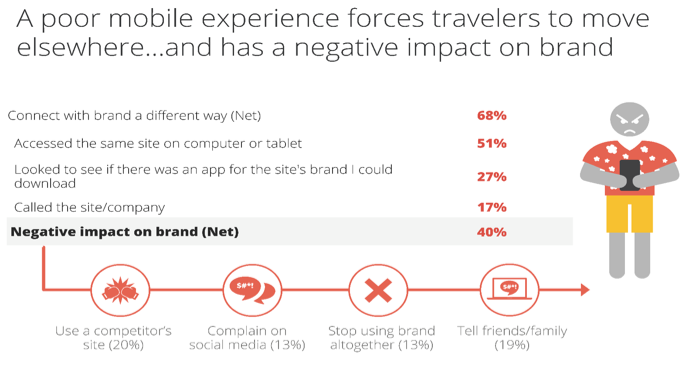 84% of leisure hotel bookers have had a poor mobile travel experience. Only 29% of those who have encountered a mobile site that wasn’t optimized actually pushed through. “That is a very low number of a very high number,” said Galambos. Google found that not only will prospective guests who have a poor mobile experience decide to book elsewhere, but 20% of them decided to use a competitors site who did offer the functionality in question. The consumers also complained on social media or told friends and family about that poor experience. “That’s the worst nightmare of any hotel marketer,” said Galambos. The bottom line? It is crucial for hotels to maintain both a mobile-optimized site and a native app. “The main takeaway here that we want to stress is the importance of maintaining an excellent website experience and not losing focus. It’s wonderful to provide apps because as we saw, hotel bookings are definitely coming through both channels. But, we want to maintain strategies in both our website and our app experience,” said Galambos.